I recently saw a video of a helicopter flying “over” the Kouga dam where the water level is currently at 7.15%. The only thing is that the helicopter did not actually fly “over” the dam. It was flying in the dam; less than 1m above the river bed. This sounds so unreal, but unfortunately it is true. It was very shocking for me to have seen that there is so little water in the dam. In some areas the dam is dry and there is just sand in the river bed. Watch the video that was posted on Facebook by Gamtoos Vallei Ingenieurswerke BK to see for yourself what on earth I am talking about (video). This video put the extent to which our precious water resources are at risk of “drying up” into perspective for me. 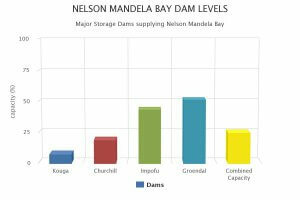 The combined levels of some of the major storage dams that supply water to the Nelson Mandela Bay area is at 24.98% 1. A similar situation is also true for the Western Cape. The average level of some of the major dams that supply water to the province were at 29.1% on the 4th of January 20182 and then 27.20% on the 22nd of January 20183. This shows a decline in freshwater resources of two provinces in South Africa, an example of the pressure that our freshwater resources are under. Water is a precious resource that is needed to meet our basic needs, which include using water for cooking and cleaning, but also to produce goods, services and food to an ever-growing population4. In this blog I want to focus on where agriculture can improve in efficiently utilising this precious resource for food production. These are just a few examples of how farmers can take responsibility for the sustainable use of their water resources. If every farmer can do their bit to save water then the agriculture industry would have a huge positive impact on the water scarcity problem. Nelson Mandela Bay Municipality. 2018. Dam levels. Accessed http://www.nelsonmandelabay.gov.za/dam.aspx on 23-01-2018 at 10:23. Western cape Government. 2018. Latest Western Cape dam levels. Public information. Accessed https://www.westerncape.gov.za/general-publication/latest-western-cape-dam-levels on 23-01-2018 at 10:39.